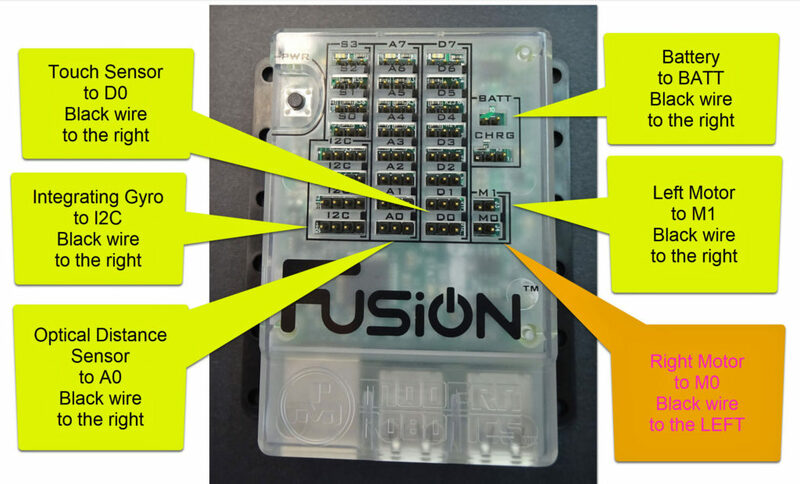 Modern Robotics provides instructions for building your Fusion Robot, click here to see them. Click Here to Print Fusion Build Instructions. Click where my arrow points to print out these build instructions. Errata? Note that on the second-last page of these instructions (June 2018), “Step 11” should presumably be “Step 13”, and “Step 12” should probably be “Step 14”. Modern Robotics has not yet (September 2018) provided a YouTube video demonstrating a Fusion build. However, their Spartan Robot has a similar chassis to the Fusion Robot, and thus their YouTube video of a Spartan build can provide some assistance if you want more help than is provided by the printed Fusion build document. Modern Robotics’ Spartan complete build video can be found by clicking here. Portions of this Spartan video that correspond to steps in the printed Fusion build document are listed below. We will re-use these steps to illustrate the Fusion build. Fusion last page: Next carefully connect the cables in to the Fusion controller, as shown below. It is unlikely that there will be sufficient power in Fusion’s battery pack to allow you to experiment with your Robot. Turn Fusion off, because the battery will not charge when Fusion is turned on. Connect the charger supplied as part of your Fusion kit in to your building’s power supply, and plug the other end in to Fusion’s slot CHRG (the black wire can be either to the right or to the left, both positions will charge Fusion’s battery). If the battery is flat, the light on the charger will glow red. It will take an hour or two to charge Fusion’s battery pack. When the battery is charged, the light on the charger will change to a green glow. NOTE: Make sure Fusion is turned off. If Fusion is turned on, and you plug in the charger cable, the light built in to the charger will glow green (erroneously indicating a full battery) when in fact the battery could be almost flat. Your Fusion battery will only be charged when Fusion is turned off.